This Compact Bible offers lots of features for a low price. It's slim size, bonded leather binding, gold page edges, ribbon marker and presentation page make this Bible an affordable and attractive gift. 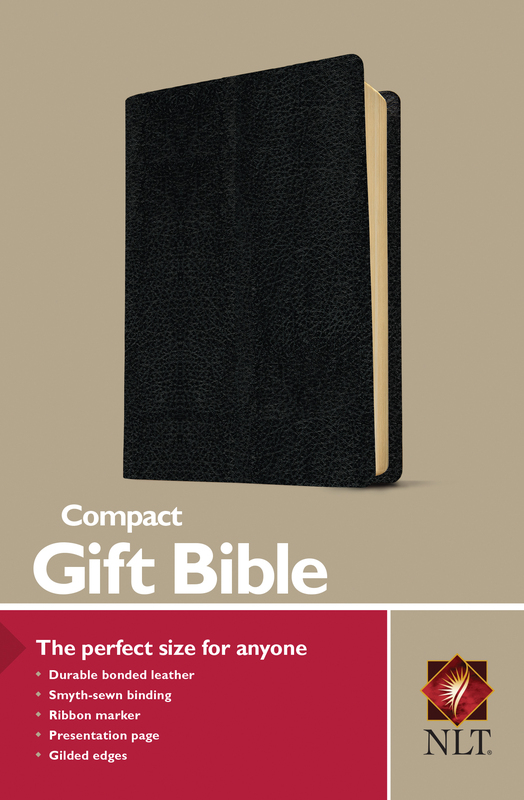 The Compact Gift Bible offers great features such as bonded leather, fine Bible paper, a ribbon marker, gilded edges, presentation page and more, at an incredible price. 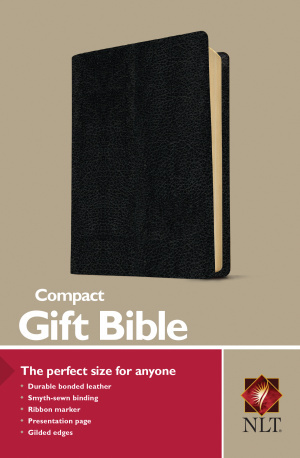 Its compact size and bonded leather binding make it a great companion Bible. On the NLT: The New Living Translation is based on the most recent scholarship in the theory of translation. The challenge for the translators was to create a text that would make the same impact in the life of modern readers that the original text had for the original readers. 4 1/8" x 6 1/4"
In the New Living Translation, this is accomplished by translating entire thoughts (rather than just words) into natural, everyday English. The end result is a translation that is easy to read and understand and that accurately communicates the meaning of the original text. NLT Compact Bible Black Bonded Leather by New Living Translation was published by Tyndale House Publishers in October 2004 and is our 438th best seller. The ISBN for NLT Compact Bible Black Bonded Leather is 9781414301723. If you are looking for a bible to just simply read the word with no extras then this is it. The translation is brilliant (not too contemporary or traditional). The bible is a great size to take and read anywhere. Well worth the very small price. Got a question? No problem! 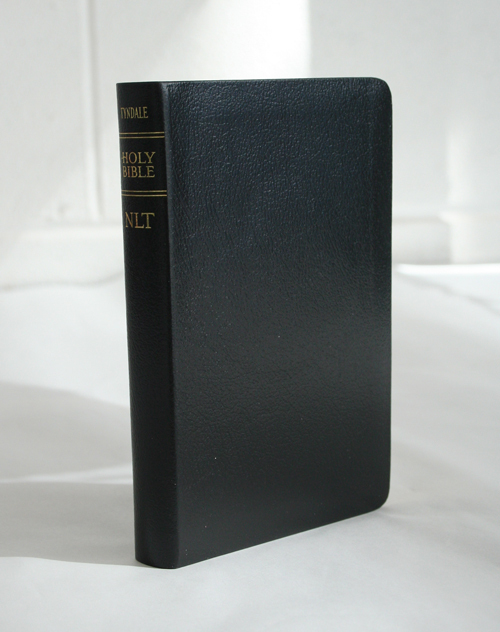 Just click here to ask us about NLT Compact Bible Black Bonded Leather. Hi, does this Bible have a ‘lie-flat’ binding? Thank you. A:No, this edition is not Anglicised, and features US spellings and punctuation. What font size does the NLT Compact Bible: Black, Bonded Leather have and is it a red letter edition? A:This particular NLT bible does not have the words of Christ in red, the font size used is 6. Does the NLT Compact Bible in black, bonded leather contain the old and new testament? also, what does the front of this bible look like? or is it the same as the picture? 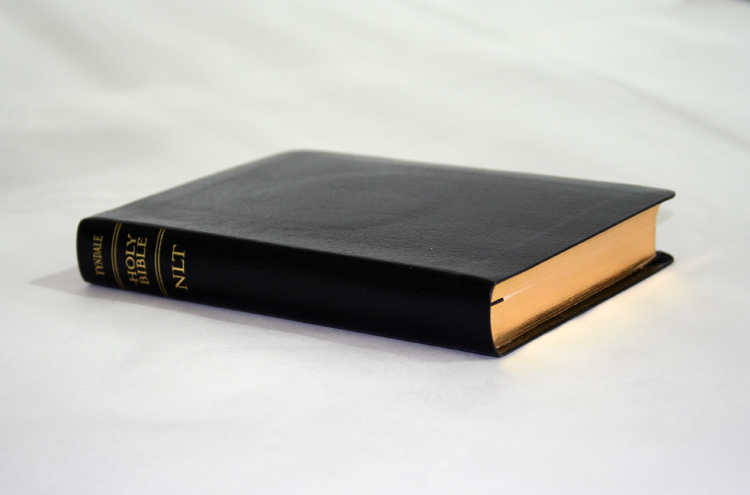 A:Yes, Old and New Testaments are included; the cover features a classic plain black bonded leather finish. 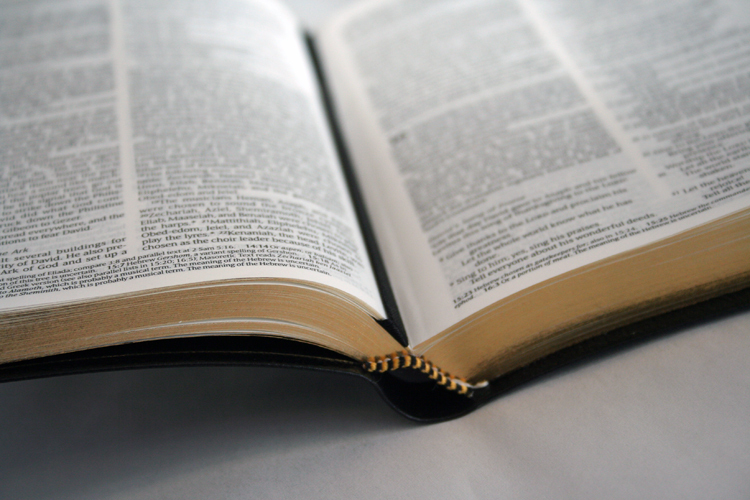 Does the Bible contain any reference material?